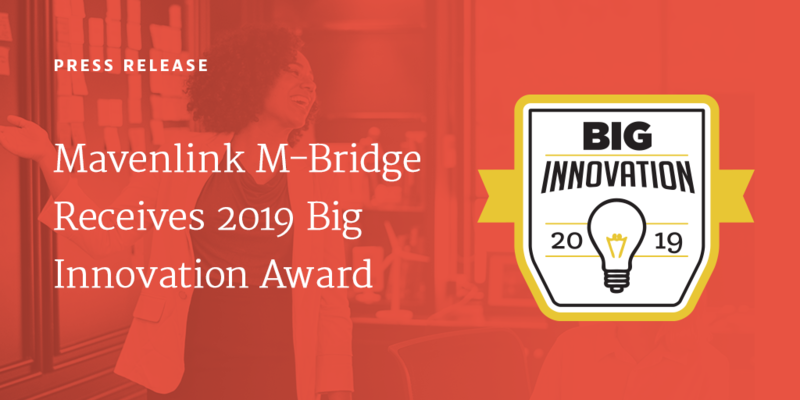 IRVINE, California, February 5, 2019 — Mavenlink, the leading provider of cloud-based software for the modern services organization, today announced its recently released M-Bridge integration and extensibility platform has been named a winner in the 2019 BIG Innovation Awards presented by the Business Intelligence Group. Mavenlink’s BIG Innovation Award for the M-Bridge platform is the latest recognition for the company. Most recently, Deloitte named Mavenlink one of North America’s fastest-growing technology companies after it generated 541 percent growth from 2014 to 2017. Additionally, Mavenlink was recently recognized with four different customer-influenced awards, including recognition as a Leader in G2 Crowd’s Best Project Management Software grid, as well as its Best Professional Services Automation Software (PSA) grid for Fall 2018. Mavenlink was also named a FrontRunner for Project Management software by Software Advice for September 2018 and named a 2018 Customer Experience award winner by Software Reviews.